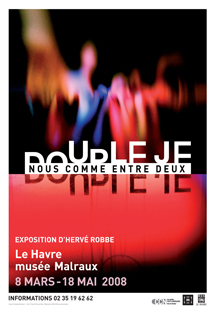 The Musée Malraux and the Centre Chorégraphique National du Havre Haute-Normandie, both located in Le Havre, have forged a reciprocal relationship over the past few years through joint projects and exhibitions. Hervé Robbe and his team at the CCN regularly accompany events, or rather seize the opportunity to create a new work of choreography. In 2004, the exhibitions "Vagues I" and "Vagues II" thus provided a pretext for developing a multi-faceted project. Hervé Robbe has, perhaps more than other choreographers of his generation, always paid special attention to image—whether photography or video—an integral component of his choreographic vocabulary. His original artistic approach developed over time until it became necessary to expound on it and consider it as such. This led to the Musée Malraux's decision to give Hervé Robbe the opportunity to create—within the specific timeframe of an exhibition, far removed from that of a performance or show, and within the specific space of the museum—new "objects" somewhere between architecture, sculpture, dance, video and audio... in which the artist asserts his freedom to make choreographic art a plural conception.These are no longer works to be performed on stage, but rather exhibited. Hervé Robbe fully invested the museum space, designing an architecture for each one of his installations encompassing a visual and musical world composed of videos and the diffusion of sound.